College Welcomed Social Justice Activist Kerry Kennedy to Speak on "Truth and Power"
The Farquhar College of Arts and Sciences Division of Humanities welcomed Kerry Kennedy, a leading advocate for human rights around the world, to Nova Southeastern University on Thursday, April 17, 2008, in the Knight Auditorium of the Carl DeSantis Building. Kennedy lectured on "Speak Truth to Power," as part of the college's Distinguished Speakers Series. 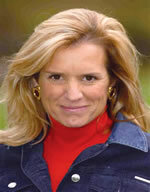 In a time of growing attention to human rights issues, Kerry Kennedy has been an international protector of those in need of justice. She has led dozens of human rights delegations to countries around the world since she began investigating US immigration abuses against refugees from El Salvador in 1981. Among her many accomplishments since then, she has published Speak Truth to Power: Human Rights Defenders Who Are Changing Our World, which features interviews with famous human rights activists such as Helen Prejean, Marian Wright Edelman, the Dalai Lama, Desmond Tutu, Elie Wiesel, and Oscar Arias, to lesser-known voices for justice. The book generated a theatrical presentation, written by Ariel Dorfman, presenting stories featured in the book, a PBS television program, education and advocacy tools distributed to tens of thousands of high schools and colleges. In an interview with Larry King, Kennedy said, "I grew up in a family where human rights, civil rights, were very central to my childhood. You know, my father was attorney general during the civil rights movement. So I think that that certainly had a tremendous influence. And then when I was in college, I took an internship at Amnesty International, documenting abuses committed by U.S. Immigration officials against refugees from El Salvador. And I was shocked to find out what our country was doing...."
Making the most of her rich family tradition, Kennedy served as executive director, and is now on the board of directors, of the Robert F. Kennedy Memorial, a non-profit organization that addresses social justice problems in her late father's spirit. She has run three programs: The National Juvenile Justice Project, which helps cities create more effective, less costly programs for dealing with young offenders; The RFK Journalism and RFK Book Awards, which recognize those who expose problems faced by the dispossessed; and the RFK Center for Human Rights, which she founded in 1988 to ensure enforcement of the UN Declaration of Human Rights. "The great thing about the human spirit is that we can draw from the depth of our own souls and find a hero within," Kennedy said. It seems she has taken her own advice. The RFK Center supports human rights defenders, and publicizes abuses such as torture, disappearances, and repression of free speech. This group also urges the US government to highlight human rights in foreign policy, supplies activists with needed resources, and creates programs to advance respect for human rights. Kennedy has also worked on such human rights issues as child labor, indigenous land rights, and judicial independence, freedom of expression, ethnic violence, the environment, and women's rights. As a special correspondent for the environmental magazine TV program, Network Earth, and on Voice of America, she reported on human rights and the environment. Kennedy is also chair of the Amnesty International Leadership Council, serves on several boards and advisory committees, and is a member of the Massachusetts and DC bar associations. She said, "For many of those who suffer, isolation is their worst enemy, and exposure of the atrocities is their only hope....The more voices are raised in protest, the greater the likelihood of change." On the origins of "Speak Truth to Power"